As the inventor of the world leading retractable belt stanchion, Tensator® has set the market standards – so why accept anything less? Unlike other retractable stanchions, the Tensabarrier® has an originally patented braking system that incorporates twin brake shoes. As a result, the webbing falls to the floor upon release before slowly retracting back into the stanchion. This originally patented braking system makes the Tensabarrier® the safest belt barrier available on the market. The Tensabarrier® has been designed with a topple angle of 35˚, which increases its stable equilibrium. 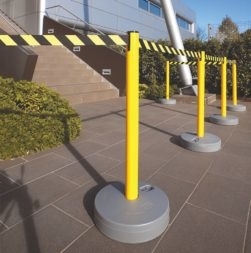 This means that when pushed, the retractable barrier posts will not fall over; instead it will tilt up to 35˚ before returning to its original position. At Tensator®, safety is taken seriously. Tensabarier® retractable stanchions allow you to enhance space, while reducing risks of costly accidents that could be caused within your business area. Whether you want to manage your queuing space, or cordon off access to a restricted area, there will be a Tensabrrier® for your needs. Genuine retractable belt barriers from Tensator®, will carry a Tensabarrier® branded tape end, which has been introduced as an additional quality measure to reassure customers they are buying the real thing. Tensator® is globally renowned as the leader in the management of the customer journey, improving the customer experience by increasing operational efficiency and customer satisfaction. Tensator’s ability to deliver strategic solutions to improve the bottom line has made it the preferred supplier for many. By empowering businesses to improve their customer journey, Tensator® works in true partnership with its clients, sharing knowledge, skills and expertise for a long term alliance. The company offers a large range of solutions that restyle the management of the customer journey, including hardware and software options. Tensator’s digital media platforms, electronic queue management, virtual queue management and display and signage products are proven to generate revenues, improve efficiencies and increase profitability. Tensator® is also the inventor of the world’s leading retractable belt barrier, the Tensabarrier®. With heritage dating back to 1881, the company has a wealth of experience in providing customer guidance and customer journey solutions. Improve waiting time by making it informative or entertaining. Coupled with our network of distributors and service partners, Tensator® supplies customer journey solutions to over 150 countries. Tensator’s market and product knowledge and its ability to consult, advise and manage products means that it can provide you with custom solutions, designed to be aesthetically pleasing and suitable for your business needs. Tensator® prides itself on offering a flexible, swift and responsive service to its customers, ensuring that requests are met as quickly as possible. This responsiveness and flexibility means it goes the extra mile as standard. To find out more about the other solutions Tensator® provides, visit our corporate site or contact us.